I have to admit that somehow, by now, sinewave.com.br starts to make me wonder… I already did put down my enthusiasm about Uppsala Solemne a bit earlier, but, no matter whether listening to latest releases of Ruido/MM, Sobre A Maquina, the incredible This Lonely Crowd and a bunch of others: Most of the recent Sinewave releases are exceptionally strong, not just from a netaudio / netlabel perspective, and definitely all the releases this label has issued so far are above average. 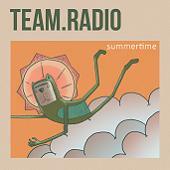 And the “Summertime” EP by Team.Radio is in no way an exception from that rule. Five songs, next to 38 minutes playing time, and a rather strong musical statement. Maybe “post rock” these days is a genre description just like any other, but in some way, it seems the girl and the four guys from Refice, Brazil, manage to actually do as you would expect dealing with post rock, leaving behind a bunch of genre boundaries and musical limitations, creating a moody and inspired acoustic experience in between, well, various kinds of progressive rock, jazz, “classic” rock (whatever that might be) and more recent shoegaze music. In some ways, this music seems dominated by various different influences: “Vegas”, the third track, brings reminiscences to German Element Of Crime. There are keyboard / organ passages slightly reminding me of Alan Parsons Project. There are ska’ish-early-Police guitar parts, there are some moments that might have grown out of listening to Pink Floyd or Rush even – yet, all these without being simple rip-offs or copies of the “might-be-originals”, and, given the band page does list some other names as influences, maybe these semblances are just incidentally. And then, of course, there also are moments completely different. “Come on”, in example, which throughout its initial passages is massively “musique noir”, one really might think to see vocalist Marina sitting in front of a piano in a dark jazz club long past midnight. And there is the 13 minutes epos “Albatross”, maybe closest to what to be found as “post-rock” these days, and an impressive monument as such – at least, to me. There’s not much to add here, I guess. The musicians definitely know their stuff, songwriting is effective and inspiring throughout all these tracks and, even slightly reminding me of a lot of different bands, always sounded original and homogenous. Vocals do stand out a little in my opinion, though, as the band is really good at knowing what their vocalist is best at and how to make use of that most effectively. So, overally: Highly recommended. Waiting what this band will be up to, in the future. And kudos to Sinewave for another great release. What a beautiful post… Cheers from your brazilian friends from TLC!